Sometimes, you just need a portable Wifi router. There's a few out there and Alcatel now has out the $170 Go-Fi on Telus. The big issue is that you'll have to get it its own pricing plan for it. Which can be expensive. The device is only $170 (or free if you sign for 2 years, plus a $15 SIM activation). The plans on Telus start at $10 for 100MB (yeesh, I'll kill that in a couple hours), or up to $65 for 6GB (yet the flex plan would charge you $70, or go up to $85 for 10GB). Still not enough for me. But, maybe it'll be cheaper than what I'm using now. Maybe I ditch the voice option of my phone, and just carry this device around with me. It'd be $45 for 2GB ... I use about 2.5 or so per month. Maybe I just watch it a little stronger... hrmm. That would be a little cheaper than my current plan. IRVINE, CA, Oct. 6, 2016 - Alcatel - the number four mobile phone manufacturer in North Americai - today announced the availability this month of its latest smartphone and mobile broadband device for customers across Canada with the launch of LUME and GO FI exclusively at TELUS. Offering the perfect amount of simplicity for smartphone users, LUME covers all the basics at a very wallet-friendly price. And with GO FI, customers get the perfect amount of connectivity in a compact and lightweight Wi-Fi hotspot, so staying connected wherever they go is a breeze. Both LUME and GO FI will be available at TELUS, with LUME also available at Koodo Shops. GO FI will be available beginning October 7, with LUME available beginning October 12. "Staying connected should be simple and affordable to all consumers, and with the introduction of LUME and GO FI to Canada with TELUS and Koodo, we're continuing our mission of making great technology accessible to all," said Steve Cistulli, President and General Manager for Alcatel, North America. Featuring a pocket-friendly 4-inch display, the LUME offers a dependable smartphone experience without breaking the bank. Powered by a quad-core processor, the LUME also delivers smooth multitasking for browsing the web, checking social media or catching up on emails. And with an efficient all-day battery, the LUME won't leave you constantly looking for a place to charge up. LUME is also loaded with exclusive Polaroid filters, so you can snap and customize your photos with ease thanks to 17 different effects and 13 styles of frames to choose from. Enjoy reliable 4G LTE data wherever the road takes you with the compact and lightweight Alcatel GO FI. With download speeds of up to 150 Mbps and the ability to connect up to 15 different Wi-Fi enabled devices, the GO FI offers an easy to use and secure way to have Wi-Fi connectivity with you. Supported by Alcatel Onetouch Smart Link application that is available for both iOS and Android devices, you can easily easily manage your connections, track data consumption, read and write SMS messages, manage user access, and change network settings. GO FI also comes with a robust battery that supports up to seven hours of continuous use. 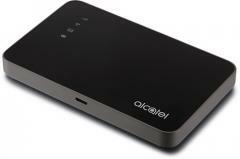 For more information and full product specifications on the LUME and GO-FI, please visit Alcatel's website.